Natural Bridge Canyon Trail is a one mile, uphill, out and back hike (two miles total) through the Amargosa Mountain foothills. But you don’t need to hike the entire thing if you don’t want to because the spectacular, 50 foot natural rock bridge is just a little less than a half mile down the trail. As one of the few designated trails in Death Valley National Park, Natural Bridge Canyon Trail is one of the most popular hikes in the park. The trail takes you through a winding canyon, under the natural bridge, and past an incredible dry waterfall, as it narrows until the end. After discovering and swimming through an amazing natural bridge in Calaveras County a while back, we simply couldn’t wait to check this one out! 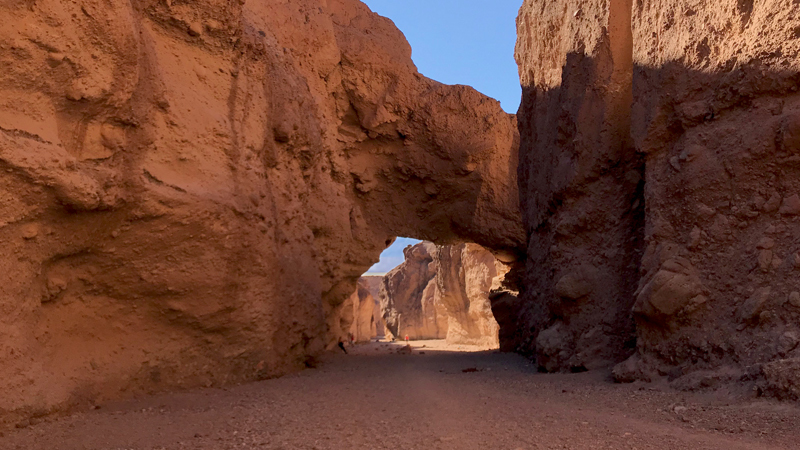 We visited this famous Death Valley Natural Bridge after hiking Golden Canyon, exploring Devil’s Golf Course, and walking out into the Badwater Basin Salt Flats. The vast differences in color, rock formations and structure, canyon trails, and mountain textures throughout Death Valley blew me away over and over during our trip. I had no idea that Death Valley is as beautiful as it is, or that there are so many things to do or see, especially in just one day! Golden Canyon, glowed in the morning sun and Red Cathedral rose up magnificently at the end of the trail. Devil’s Golf Course was beautiful, yet rough, sharp, and menacing. The Badwater Salt Flats were smooth, bright white, and as expansive as an ocean. Natural Bridge Canyon was rocky and mostly a reddish-brown color, with an amazing rock bridge spanning the canyon. The Natural Bridge Canyon Trail hike was uphill but not too difficult, and because it was the mid-afternoon, there were some shady patches along the canyon walls so we could escape the heat a bit. As we rounded the last canyon turn and the natural bridge came into view, we all were in awe. At 35 feet above the canyon floor and 50 feet tall, it’s much bigger in person that it looks in the photo! Because Natural Bridge Canyon Trail is so close to Furnace Creek, it gets a bit crowded. There were A LOT of people on the trail when we were there and we had to wait a while to get a family photo and some photos of the bridge without lots of people in it. Luckily, the canyon is gorgeous — and if you hike further up the trail a bit, you can see Badwater Basin in the distance and a huge, smooth, dry waterfall and several smaller dry waterfalls. Arches are often found on hillsides or up on canyon walls. Natural bridges are larger and found in canyons, connecting one side of a canyon wall to the other. Unlike the sandstone arches and natural bridges in Utah, Death Valley’s arches and natural bridges are often made of conglomerate rock. Although flash floods are not a common occurrence in Death Valley National Park, over the years they have impacted the way canyons in the Amargosa and Panamint Mountains are formed. Natural Bridge Canyon Trail is an perfect example of this. According to a display at the trailhead, while carving the canyon, the stream sought a course along the path of least resistance and formed a sharp bend that eventually eroded into a fin of rock. Pounding floods punched a hole through the fin, creating a shorter route down the slope. Subsequent deepening of the canyon left the old meander behind — the alcove on the north side — and the bridge looming over the canyon floor. Natural Bridge Canyon holds just one of 17 major natural bridges found in Death Valley. When I found that out, I tried to find out where the others are so we could visit them, but it was not going to happen. Many of the natural bridges’ locations are kept secret to help protect and preserve them, and the other natural bridges whose locations are known, are located off rugged, dirt roads that require high clearance and special tires. I feel so lucky to have been able to visit this beautiful spot! Natural Bridge Canyon is located at the end of the unpaved Natural Bridge Road off Badwater Road, about 13.5 miles south of CA-190 and four miles south of the Artist’s Drive entrance in Death Valley National Park, California. There is a large dirt parking area and vault toilets at the trailhead. The Natural Bridge Canyon Trail is a one mile out and back trail past a natural bridge to a dry waterfall that totals two miles. If you only want to see the natural bridge, it is only a little over a quarter mile (15 minutes) from the parking area. The hike is relatively easy, but it is uphill and the ground is uneven and rocky because you’re hiking up the canyon wash. Early morning or late afternoon is the best time to hike this trail as the sun is not directly overhead. Please be respectful of this majestic formation. There are stress fractures throughout the natural bridge and climbing on it could damage it forever.